I hope that everyone enjoyed their weekend! Ours was pretty busy, which was nice. 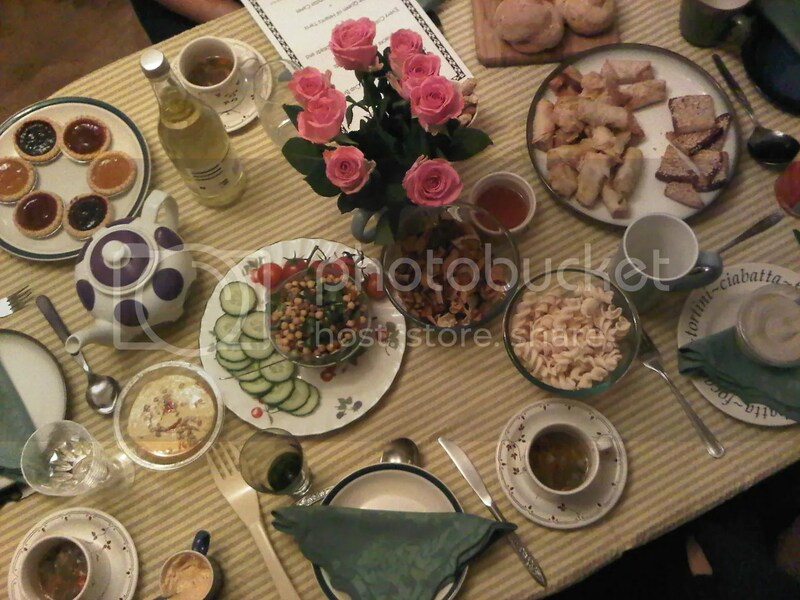 We celebrated a belated-Mother’s Day at my parents house, and my sister put together this fabulous Mad Hatter’s Tea Party – complete with Mock Turtle soup, vegetable crisps, Chinese snacks and an amazing bean salad. Check out my ‘fork’! I brought some of Ms Cupcake’s delights to finish the meal with – we divided them up into quarters so that everyone could try all of the flavours, and then we settled down to a game of Bananagrams. I love just sitting around the table and catching up with my family – we don’t get to see each other too often so it’s nice to spend some time together. Sunday was a lazy day (yay!) – once Trout and I got home I was straight into my jimjams and settled down with the newspapers, before getting my bake on! I haven’t baked in such a long time, it was nice to spend some time with some of my favourite ingredients. I baked a banana and chocolate chip cake with vanilla frosting, and brought the cake into work this morning – I’m a little nervous as it was a new recipe, so fingers crossed everyone likes it! VegFest on Saturday was brilliant, as usual! I ate so many samples, stocked up on a few different types of sausage, some sweets, and plenty of cupcakes. If you can get to the London or Bristol festivals, I definitely recommend that you do! I finally got to meet one of my favourite bloggers; Jojo fromVegan in Brighton! We must have ‘known’ each other for about five years, through blogging and Twitter, and despite living in the same city and going to the same shows we hadn’t met before! She had a stall for her non-profit bakery, Operation Icing, and had completely sold out by the time we got there at 2.30pm – I was gutted I didn’t get to try the cupcake flavour she had made for me (peanut butter Oreo) but so pleased that she had been so successful. Well, it’s a new start to the week and (hopefully) no snow just yet! I haven’t been to DanceFit for a couple of weeks so I’m really looking forward to that tonight. Other than that, not too many plans for the week. I want to get back into writing in the evening, on more of an article-basis, so hopefully I will get some time to do that. What do you have planned for this week? Did you have a great weekend? Sounds like you had a lovely weekend, peanut butter oreo sounds amazing, what I shame you missed it! I know! She’ll just have to make some more…! all of your weekends sound like so much fun! I try to pack in as much as possible! Sound like a wonderful weekend! Love the idea of a mad hatters tea party! It was so much fun! And delicious! What a great weekend! I’m excited we finally met too! Thank you so much for mentioning my little business again and for being the inspiration for the PB Oreo cupcake! I’m baking a very limited number right now for delivery to WaiKikaMooKau tomorrow morning. If they sell well hopefully they’ll become a regular thing! I didn’t manage to get to WaiKika today :( I will try one one day! !